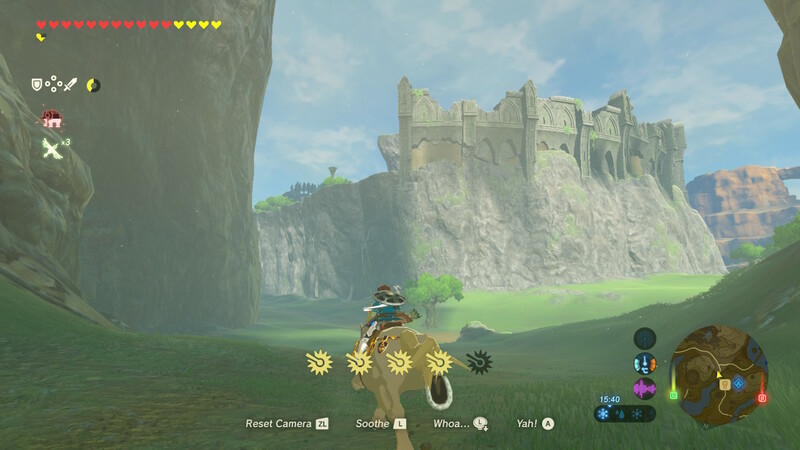 Exploring the world on horseback in Breath of the Wild. Autonomy with purpose. Most other games — even open-world games — are completed by following a long string of story quests. Breath of the Wild is different. After finishing the tutorial area, it presents its goal straight away: Make it to Hyrule Castle and defeat the wicked Calamity Ganon. Along the way are several intermediate goals. How and when you accomplish these, or even if you do the intermediate quests at all, is up to you. Most likely, this will involve journeys into the unknown. A sense of wonder. After first playing the game, I remarked that it “captures the majesty of exploration — and the danger.” Months later, that remains true. An early expedition to start a story quest required preparation – gathering ingredients, brewing potions, cooking meals – navigating a broken, monster-infested trail, and climbing up and down hills. Reaching one landmark required scaling a cliffside to hide from the guardians patrolling overhead. Even now, in remote parts of the map, I carefully skirt monsters that are just not worth the risk of fighting. And it’s worth it. It’s worth it for the views; the sunrises and sunsets, the misty cliffs by the sea; the glider flights above the world. It’s worth it for the discoveries, such as lost temples. And it’s worth it for the experiences; the horse ride past baobab trees and curious monsters; the single short session I discussed at the top of this post. 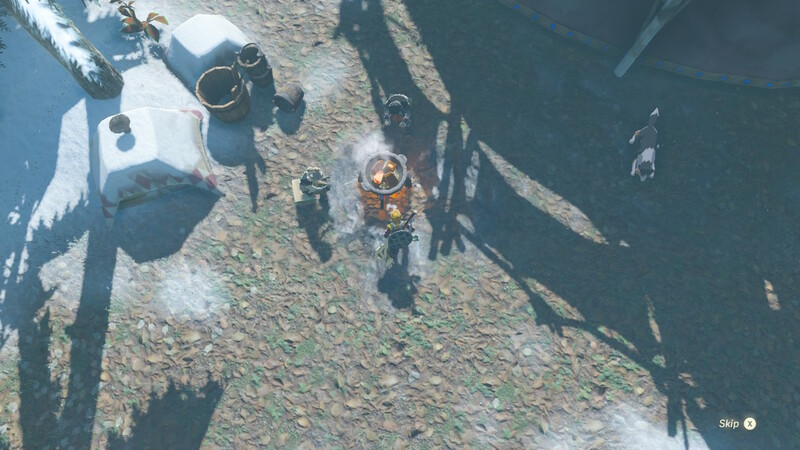 Huddled around a cookpot in Breath of the Wild. And it just works. I cannot overstate the importance of BotW getting the basics right. 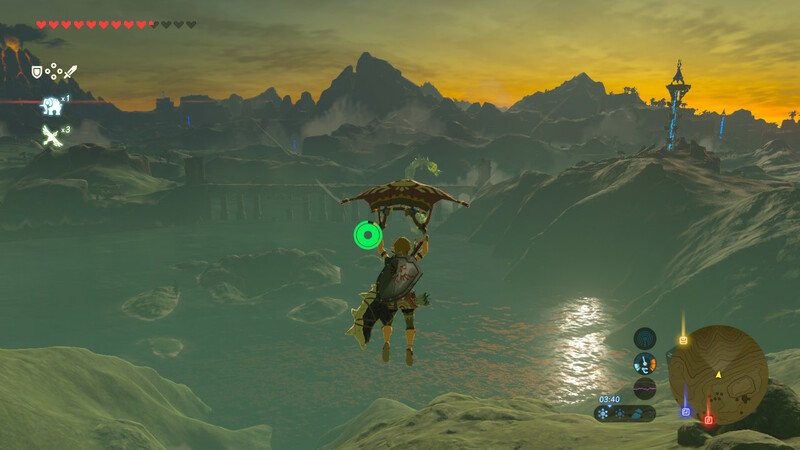 The moment-to-moment experience is frictionless: Link climbs what I want him to climb and jumps where I want him to jump. Combat, while fairly simple, is tense and elegant – I circle foes, raise my shield, and get in blows when the time is right. The main story is simple and effective, with two standout sequences so far: one exploring Link’s history with a particular people, and the other combining Arthurian myth with more modern fantasy. Even the ambient surroundings benefit from attention to detail: townspeople run for cover when it rains! One of my favourite games in years. I love BotW’s design, which offers just enough structure to keep me moving forward. I love exploring its world, either as a way to move forward or simply for its own sake. And I love the actual experience of playing. I’m still not finished, not after all these months, and even as I fill in more of my map, I continue to discover new wonders. I look forward to seeing what more lies in store. Great write up Peter. So much so that you have me thinking about playing it right now. But if I do, my afternoon will be gone, adventuring in a beautifully crafted virtual world where I can vicariously live an ideal life in anticipation of what lies just over the horizon. It annoys me that it took so long for me to get into the game, having a switch that was collecting dust for months, but I am grateful I did so. Thanks, glad you liked it! I also picked up the game late – didn’t get a Switch until after Christmas – and am very glad I did.